The Pictograph on Spring Equinox. One painting in particular caught my eye and that one is shown above. The cute little triangular guy seemed almost out of place with the other figures and was a darker color. It was beautifully painted and obviously deliberately made to look the way it does. When you see it, it commands your attention and your admiration for a well done painting. It makes you wonder if it has some kind of meaning. As an amateur astronomer, I noticed an interesting resemblance of the little guy to Orion that you see in the winter sky, but the other stuff looked like gibberish. Later on as I was looking at the stars I found there were some bright stars close enough to Orion and in the right places to trace out the lines of the cute little triangular guy, whom I promptly named "Skywalker". In looking around that same part of the sky, I immediately spotted the kite-like shape in Canis Major's tail and also the shape next to it in the picture. I could then see the form of the Big Bird-like shape behind Orion using Auriga, Gemini and the front part of Canis Major (Sirius is the heel). I knew right then and there that the painting depicted the night sky in winter, all I had to do was trace out the lines in the stars just the way the artist did hundreds of years ago. Using my computer astronomy program, I printed out star charts showing the skies visible from Paint Rock and sure enough, I found all the parts of the artwork in the winter sky just like the pictograph showed them. The artist was unaware of our standard European model of constellations and painted the shapes he saw instead. Additional research showed me that the pictograph indicates that Orion and the constellations that make up Big Bird all rise in the sky in the direction indicated by the ray-like light-colored lines. Later on a tomahawk rises and proceeds in a different direction also indicated by the different direction it's rays point to. Rather than rise like the other stars, the tomahawk rotates in a more obviously circular movement around the star Gacrux which hovers at the southern horizon. The tomahawk starts off cutting face down and as the night progresses toward dawn, the tomahawk rotates around until its cutting face is up at the horizon as if it was being raised to strike. 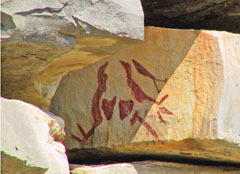 The pictograph appears to use the bottom of the rock it is on as the southern horizon and the and the end of the handle appears to be painted partly on the bottom side of the rock so as to show it going under the horizon. The tomahawk's purpose seems to be to show the rotation of things close to the southern horizon. The tomahawk was painted with some light colored rays emanating from it, I think to indicate it's direction of motion, which is different from the other stars in the sky. Closeup of tomahawk area shows directional rays and thin black lines. What appears to be a faint star just left of the handle is actually only a late afternoon shadow, it's not part of the pictograph. I call the figure on the left Great Weasel and find that it takes up a huge part of the winter sky, comprising a dozen constellations. It is so big that you cannot see it's bottom parts, except that each night you can see a little more of Great Weasel's feet and tail and as winter progresses toward spring and by then it's nose will have progressed to below the northeastern horizon while his feet and tail are both finally visible just above the southwestern horizon and Great Weasel stretches all across the sky just before dawn on the first day of spring. Neat, huh? The only time you can see the tail is for a few days around the vernal equinox; at all other times throughout the year, the tail is below the horizon and cannot be seen in the northern hemisphere. That is what convinced me that the pictograph was intended to show the stars in the sky on the first day of spring. While some of the constellations are also winter constellations, the Great Weasel, as shown in the pictograph, can only be seen completely that way on the vernal equinox. This painter knew what he was doing. The animals pictured in the painting appear to me to be dead, as indicated by the feet being in a dead position and the Skywalker appears to be marching upwards to the heavens. Many Indians in the Southwest saw the sky as the place where the souls of the departed went and the the stars were their campfires. They believed that once a person died you could never say their name again as it would disturb the deceased's spirit, which would come and haunt you. The depiction of the animals as dead and the Skywalker on his way in the shadow while walking up the light, seems to confirm to me that the image is indeed of the sky in terms of the animals and things the local Indians saw among the campfires in the sky. The Indians saw all animals as related by being the other children of Mother Earth and there were animals in their afterlife, The Happy Hunting Ground where the hunt went on. I hope my use of the word Indian to describe these unknown people, probably the ones the Spaniards called the Jumanos (humans), but I am part Indian, Choctaw, and to me, growing up in Oklahoma, the word Indian was always a good word and evoked visions of very special people who knew things about nature the others didn't and who possessed great skills that allowed them to thrive where others failed. To me the word Indian is preferrable to indigenous persons or natives or aborigines or whatever politically correct name anyone wishes to use and I am rightly proud of my Indian heritage and yes, I know both Choctaw and Cherokee history. Indian is only a bad word if you see it as bad, I see it as a good word, even if it is utterly inaccurate as none of these people had ever been to the East Indies. The Skywalker "walking up the light beam" on the Vernal Equinox.On the first day of spring a shadow is cast over the painting and at around 2:45 PM, the line separating light from shadow is right at the feet of the Skywalker making it look as though he is walking up the ray of light to the sky. The angle of the light is perfectly perpendicular to the axis of the skywalker. This sign is locally considered a reliable indicator of the vernal equinox. Meanwhile, about 40 feet away, there is a small circle within a circle that has a spear of light briefly touch the center of the inner circle at the same time the light touches the skywalker's feet but it moves away quickly - Kay discovered it this year, March 20, 2005 when we were all present and we all saw it immediately when she yelped (she had been watching it for a couple of years waiting for something to happen). As far as I know, there are no other skymaps yet discovered in any North American pictograph or petroglyph sites. It is unique to Paint Rock and that makes Paint Rock an even more special place and I feel immensely priveledged to have been the one to notice the true meaning of this remarkable painting.